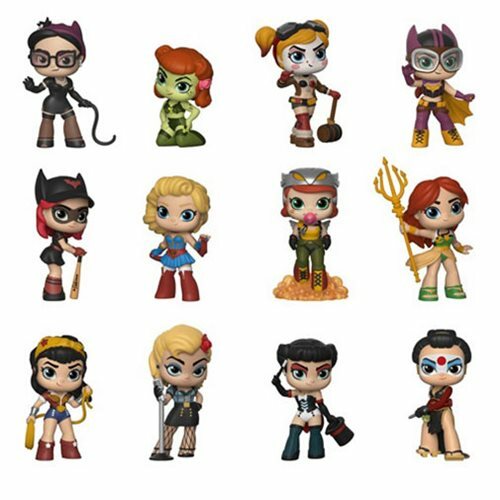 These DC Bombshells Mystery Minis are as fierce as they are adorable. The dream team includes Wonder Woman, Batwoman, Batgirl, Harley Quinn, Katana, Poison Ivy, Catwoman, Supergirl, Mera, Hawkgirl, Black Canary, and Zatanna, all with a 1/12 rarity. Each stylized vinyl figure measures approximately 2 1/2-inches tall. This DC Bombshells Mystery Minis Display Case includes a total of 12 individually packaged mini-figures.